Let’s hope that my honesty is not confused with stupidity. I wanted to watch Ridley Scott’s Alien, which supposedly revolutionized visual effects in film. Call it my luck or misfortune that I ended up watching its sequel first. So I am laughing and crying at m situation at the same time. The Alien film franchise started with Ridley Scott’s Alien (1979), James Cameron’s Aliens (1986), Paul Anderson’s Alien vs. Predator (2004) followed and the latest Prometheus (2012) by Ridley Scott is a prequel to the original Alien. And just the way technology advanced, content suffered. *Talking about the film Aliens, the film is equipped with an uncomplicated three-act structure. The protagonist, Ellen Ripley (Sigourney Weaver) confirms with Burke “You’re going out there to destroy them, right? All right, I’m in.” and that marks the second act. Similarly, when Ridley decides to go back and get Newt all alone, is where the climax starts shaping. I would not talk about the visual effects, considering the film was out in 1986, much after the revolution and two years after Cameron’s The Terminator was released. I did not find them too compelling. This film can be expressed in a flowchart format excellently. Ripley has two options, whether to accept or abort the offer by Burkes. Ripley has a premonition about the android being a traitor, either she is right or she is wrong. Burkes is going to successfully get the alien specimen through the ICC or not. Numerous conflicts form a thrilling composite. On a negative note, the film started off with absolutely fabulous editing. The tempo of each sequence teased me with the sight of an alien and ended in an anticlimax, which indeed kept me at the edge of my seat. As soon as their mission begins, till the aliens actually show up, I felt the film was a bit draggy and monotonous. About halfway across the film, I noticed one factor, which gives the film a great advantage over many others in the same genre. A year ago, when I was studying Cinema as a subject in college, I comprehended that any type of cinema, whether it is a neo-realistic cinema or an expressionist one, needs interesting characters. Interesting characters make cinema, an illusion seem convincing and gripping. Aliens is equipped with extremely well orchestrated characters. 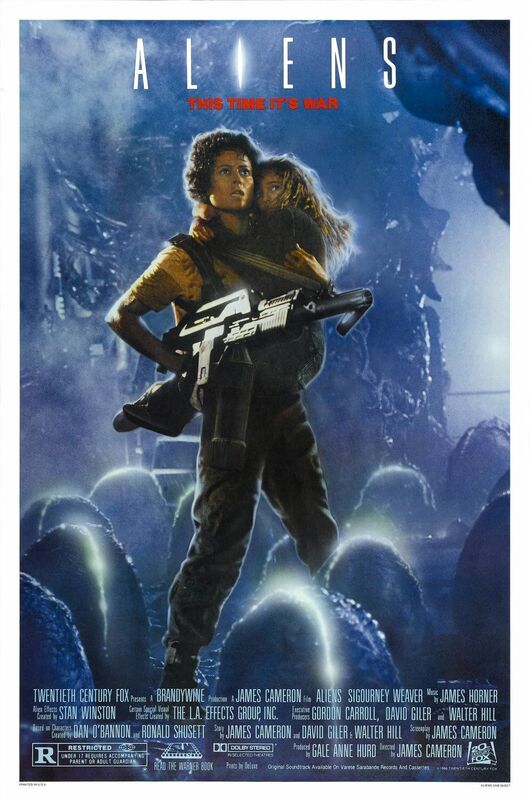 We have damsel in distress, Newt; hero, Ripley; lover, corporal Hicks; Judas, Burkes; virago, Vasquez and most importantly, Ripley’s emotional aspect – Ripley as a mother! I do not know if the makers thought of it while making it or it is a personal opinion about the film. The aliens breed by impregnating. The parasite uses a human body to produce an alien. The climax is a faceoff between the alien mother and Ripley, both trying to protect their offspring. In which Ripley succeeds. Whether it is Titanic or the Terminator or in this case, Aliens, Cameron always reaches out to a superficial subject and weaves it excellently with human emotions. *After watching The Terminator again, I realized that I was wrong in judging the visual effects of the film. Visual effects of Aliens are far more superior than The Terminator. Although I couldn’t help but compare the futuristic earth with the Colony in Aliens. Did you use the same set for both Mr. Cameron?